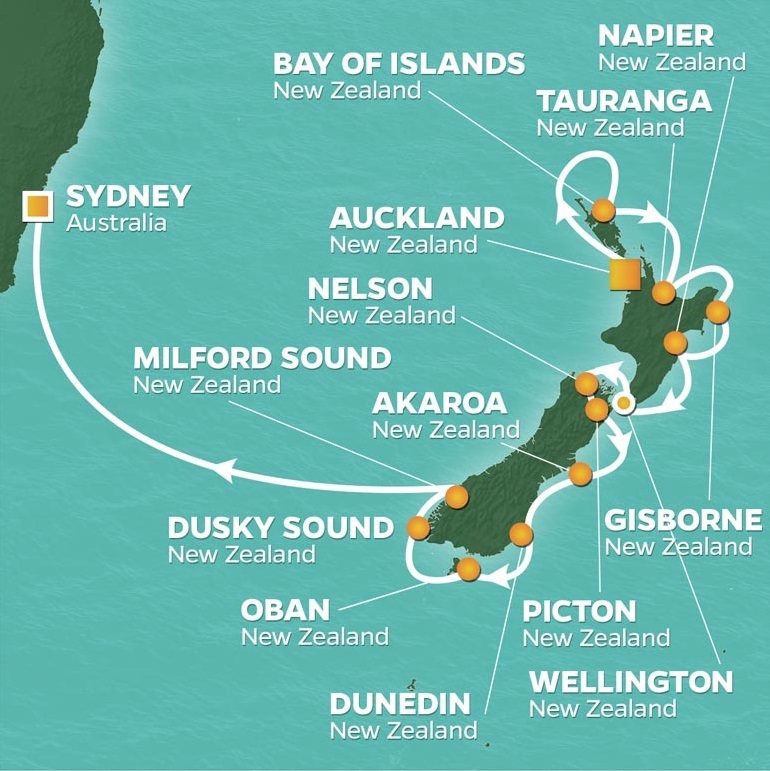 PerryGolf is proud to partner with Azamara Club Cruises for an exceptional golf and sightseeing voyage to New Zealand and Australia on board the outstanding Azamara Quest. It’s the perfect opportunity to leave the northern hemisphere’s winter behind for the sunshine and long daylight hours of a southern hemisphere summer! Our itinerary begins in Auckland, New Zealand. After thirteen days cruising both the north and south islands we sail out of the majestic Milford Sound for ... Read More. Sydney where our spectacular arrival into one of the world’s most iconic harbors signals the conclusion of our voyage. In addition to the Sound along with Stewart Island, our New Zealand experience will include the wine country of Marlborough and Hawke’s Bay. Enjoy the art deco tours in Napier, and the Tauranga’s kiwi farms and of course some of the most majestic natural beauty on earth. Our golf is equally spectacular. We have been able to include New Zealand’s most famous golf courses, each highly dramatic and outstanding layouts: Kauri Cliffs, Cape Kidnappers and Royal Wellington along with the highly regarded Christchurch Golf Club and the charming Chisholm Links at Dunedin. We also offer an easy two night offship overland option allowing guests to delve into the spectacular Southern Alps of New Zealand’s South Island to visit Queenstown and play the stunning Jack's Point layout. Finally on arrival in Sydney we offer a three night post cruise package including play on two of its finest golf courses - The Lakes and the iconic New South Wales Golf Club. Many of our guests are golfing couples but an equal number are Golfers travelling with a Non-Golfing spouse who are exceptionally well catered to as well. In addition to the fabulous on board facilities which all will enjoy during our “sea time” as we cross the Tasman Sea, a wide selection of Azamara Shore Excursions® are offered in each port, allowing guests to explore as much or as little of the culture and countryside as they prefer. Azamara distinguishes itself as a specialist for “destination immersion” by providing more time in port than other major cruise lines. On board, guests are absolutely spoiled. The 690-passenger (410 crew) Quest is large enough to provide every comfort and amenity; outstanding restaurants and bars, an exceptional full service spa, an excellent variety of evening entertainment. Yet she is small enough to provide an intimate, clubhouse style experience while comfortably navigating smaller harbours. In addition to “normal” cruise features, all soft drinks, specialty coffees, boutique daily wines, and a choice of select standard beers and cocktails are inclusive within the cruise fare, as are all gratuities. Leave winter behind and join us on this magical adventure in the long daylight hours of the southern hemisphere! * Jack’s Point is played on optional overland overnight excursion to Queenstown. Embark Azamara Quest from 1:00PM until 4:30PM. Auckland is the capital and most populous city in New Zealand. The only city in the world built on an active basaltic volcanic field; its warm, coastal climate allows for surfing at black-sand beaches, picnics in secluded coves, or horseback riding. Tour a sheep farm, take a guided tour of the coastal rainforest, or go on a harbor cruise. Immerse yourself in Auckland’s art, Māori culture, and history. View the beauty of the coastline from above when you go hang gliding, or take a trip around the winemaking regions of either Matakana or Waiheke Island. Enjoy Auckland on your own or via Azamara Shore Excursions®. Waitangi is the home of the Māori culture. If one of us walks right up, leans in close, and touches noses with you, don’t be alarmed. We’re just saying a friendly “hongi” hello. You may have seen the haka dance, which has been made famous by the New Zealand Rugby team before the start of a match or watched the movie Whale Rider. However when it comes to really understanding and appreciating the Māori culture and people, the best way to do so is visit Waitangi. Māori chiefs signed their 1840 accord with the British Crown at the Waitangi Treaty Grounds, making it New Zealand’s most historic site. Not only does Waitangi honour the birthplace of a nation and offer stunning views of the Bay of Islands, but it also features cultural and musical performances, including, yes, the haka. So if you’ve ever wanted to dive into an absolute treasure trove of all things Māori, come with us to Waitangi. Enjoy Waitangi on your own or via Azamara Shore Excursions®. GOLF: Kauri Cliffs was designed and built by David Harman of Golf Course Consultants, Orlando, Florida. It is a par 72 championship golf course that measures 7,119 yards / 6,510 metres with a selection of five sets of tees to challenge every skill level. Tee selection is an important decision here, with gorges and fairways with some of the healthiest and thickest grass in the world making it easy to mount up a tally of lost balls. Fifteen holes view the Pacific Ocean, six of which are played alongside cliffs which plunge to the sea. The beautiful inland holes wind through marsh, forest and farmland. Kauri Cliffs is currently ranked by Golf Digest as #39 among the top 100 in the world. Tauranga is situated midway on the North Island’s eastern coast, and was settled by the Māori in the 13th century. It is now the most populous city in New Zealand’s renowned Bay of Plenty. A popular coastal town with a subtropical climate, Tauranga features beautiful golden beaches, lush parks, and a laidback atmosphere, while offering an array of adventures including dolphin watching, hiking, fishing, sailing, and diving. Choose from nature discovery tours, a Tauranga sightseeing trip, or even a jet boat ride. Head to Mount Maunganui Beach— a favorite locale with both surfers and hikers alike—or visit such sites as Kaimai Mamaku Forest Park, Kaiate Falls, and The Strand waterfront area for its variety of restaurants, pubs, cafes, and nightclubs. Enjoy Tauranga on your own or via Azamara Shore Excursions®. Gisborne is known for its superb cuisine, wineyards and surf beaches. It is labelled the “Chardonnay Capital of New Zealand” and does not disappoint with its all-encompassing wine trail. Historically, Captain Cook’s first New Zealand landing – in October 1796 – was Kaiti Beach, which neighbors scenic Te Poho O Rawiri Marae. Maori culture is evident in Gisborne with records recognizing Titirangi (Kaiti) Hill as the site of arrival for the migratory waka (canoe), ‘Horouta’, which carried the first Maori to the region. Enjoy Gisborne on your own or via Azamara Shore Excursions®. Napier is located in Hawke’s Bay on the eastern coast of the North Island. It has a population of 60,000 and together with its sister city Hastings, is referred to as one of “The Bay Cities.” Its exceptional concentration of 1930s Art Deco architecture is symptomatic of the city having been razed by the 1931 Hawke’s Bay earthquake. Make a pilgrimage to Pania of the Reef, a statue of a figure of Māori mythology, and one of the most photographed tourist attractions in the country. Take a guided walk around the city, or visit the gannet colony at Cape Kidnappers. Spend a day testing out the local vineyards, or stop by the Napier farmers’ market for fresh artisan products. Enjoy Napier on your own or via Azamara Shore Excursions®. GOLF: Cape Kidnappers is consistently rated the #1 course in New Zealand and has received critical acclaim from around the golfing world. This Tom Doak design occupies a huge expanse of property, with the drive from the public road to the clubhouse taking you through a sheep and cattle station. The golf course is set on pristine land, wedged between the station and the huge cliffs of the Cape. The much photographed course has a number of holes separated by deep ravines which run down to the South Pacific Ocean. The course also offers commanding views over the wine region of Hawkes Bay and the nearby small port town of Napier. Wellington is is located at the southwestern tip of the North Island of New Zealand and is often referred to as “the coolest little capital in the world”. It has fantastic nightlife, including renowned entertainment district of Courtenay Place as well as an internationally recognized coffee culture which has made Wellington both a cosmopolitan and relaxed city. From 19th-century wooden cottages to streamlined art deco structures, the city is filled with sculptures, fountains, and art galleries; be sure to visit The Museum of New Zealand Te Papa Tongarewa, the national museum and art gallery. Take a ride on the Wellington Cable Car, enjoy stunning panoramic views from the top of Mount Victoria, or tour the famous Oscar-winning Weta Cave—home to props, collectibles, and souvenirs of such movies as Lord of the Rings, Avatar, Man of Steel, and Narnia. Enjoy Wellington on your own or via Azamara Shore Excursions®. Nelson is nestled on the shores of Tasman Bay at the top of the South Island of New Zealand, and is named after explorers Abel Tasman and Lord Horatio Nelson. The region is steeped in Māori history, but it’s also a vibrant urban hub where you’ll find boutiques, art galleries, alfresco dining, and hundreds of retail outlets. Take your time exploring the quaint heart of the city and its tree-lined streets. Climb up to point zero and be rewarded with breathtaking panoramic views of the area—two massive bays surrounded by hills and mountains. An area of extraordinary beauty, the Nelson Tasman region is home to several film locations from the Lord of the Rings and The Hobbit trilogies. Enjoy Nelson on your own or via Azamara Shore Excursions®. Picton is situated in the Marlborough region, and is close to the head of Queen Charlotte Sound on the South Island. The area offers a variety of adventures including fishing, swimming, and bird watching. The Edwin Fox Maritime Museum is also a popular attraction, showcasing the fascinating adventures of one of the oldest ships in the world, as she sailed around the globe. Take a wine tour through one of the vineyards of Picton, and sample acclaimed wines like Pinot Noir, Riesling, and Cabernet Sauvignon. Visit the playful fur seal pups at their colony near the waterfall at Ohau Point or conquer The Queen Charlotte Track on foot or by mountain bike. Enjoy Picton on your own or via Azamara Shore Excursions®. Akaroa is named after the Māori word for “Long Harbor”, and is a village situated in the heart of an ancient volcano on the South Island of New Zealand. It’s waters are home to the world’s smallest and rarest dolphin, the Hector’s Dolphin, and it is a haven for animal lovers. Spot New Zealand fur seals, little blue penguins, and various sea life. Take a tour of an Alpaca farm and get up close and personal with the unique animals. View the Colonial architecture, crafts, and cafés as you explore the Outer Bays. For some great surf, visit Le Bons Bay or Okains Bay beaches. The drama of the landscape allows you to slow down to take it all in. Enjoy Akaroa on your own or via Azamara Shore Excursions®. GOLF: Christchurch Golf Club has a proud history that dates back to 1873. The club is the second oldest in New Zealand and the fifth oldest outside the United Kingdom. Its Shirley Links course has held numerous New Zealand Open and Amateur Championships. In 1990 it hosted the World Amateur Team Championship. The course is renowned world-wide as a challenging championship course of the highest quality which offers a fair test of golf for both club and professional golfer. The Club Patron is former Club Champion Sir Bob Charles, New Zealand’s most successful professional golfer, best known for winning the 1963 British Open at Royal Lytham & St Annes, England. Dunedin is located on the southwest coast of the South Island of New Zealand, bordered by the Tasman Sea. The gold rush in the early 1860s made it the richest province in the country, and brought people from far and wide in search of wealth. Settled by Scotland, a statue of the poet Robbie Burns looks over the Octagon in the city’s center. Take a guided tour around the city and view the Flemish architecture and the Otago Peninsula. Stroll along one of the many beautiful, white sandy beaches. View some of the wildlife unique to the area, like the Northern Royal Albatross, the Little Blue Penguin, and the Kiwi. Learn more about local culture at Toitū Otago Settlers Museum, where you’ll discover the story of the people who settled here. Enjoy Dunedin on your own or via Azamara Shore Excursions®. GOLF: Chisholm Links, located just outside Dunedin, is a genuine links course in the truest sense of the word and may well be considered the hidden gem of this golf voyage. Developed on reserve land in the 1930s, several of its holes occupy a magnificent headland wedged between two beaches. It is hole #9 which guests tend to remember most keenly with the tee clinging to the edge of a huge precipice high over picturesque Tomahawk Beach. The playability and character of the holes along with striking views over the Pacific Ocean and neighboring beaches make it a very special experience. The links have previously hosted the New Zealand Amateur Championship in 2003 plus three Australasian PGA Tour Events. An option at supplementary cost is provided for PerryGolf guests to go deep into New Zealand’s Southern Alps inclusive of golf at the highly rated and spectacular Jack's Point, with nongolfing spouses able to enjoy free time in beautiful Queenstown. All guests will enjoy an overnight stay with dinner and drinks, and will rejoin Azamara Quest the following evening in iconic Milford Sound. February 1 Mid afternoon departure from Dunedin following golf at Chisholm Links, for the scenic 4 hour drive to Queenstown. Overnight with dinner & drinks, plus breakfast in Queenstown 4 star hotel. February 2 Golf at Jack’s Point, day at leisure or sightseeing for nongolfing guests. GOLF: Jack's Point Golf Course is situated between the majestic Lake Wakatipu and 2,300 vertical metres of the Remarkables Mountain Range. Jack's Point was named after a 19th century Māori local named Jack. He was awarded a medal from the Royal Humane Society of Britain after saving the life of a man when they had capsized in Lake Wakatipu in winter 1862, an extraordinary rescue. It traverses through wetland to the lake edge encountering steep bluffs, indigenous vegetation and wildlife. The course is not only one of the most spectacular in the world but with an 18 hole par 72 Championship course offers a challenging and lasting experience to any calibre of golfer. Overnight with dinner & drinks, plus breakfast in Queenstown 4 star hotel. February 3 Morning all guests at leisure in Queenstown. Midmorning departure for the scenic 4 hour drive to Milford Sound, rejoining Azamara Quest late afternoon. Stewart Island offers a glimpse into a simpler, slower lifestyle, in rhythm with the sea and the tides, attuned to the natural world of bush and beach. In 2002 the very qualities that make this a great place to treasure were recognized in the formation of the Rakiura National Park, comprising 85% of the island's 1570 square kilometres. From the 13th century the island's rich resources of native flora and birds, seafood and that very special delicacy, the titi (Sooty Shearwater/Muttonbird) provided a bountiful harvest for Maori. Early in the 19th century explorers, sealers, missionaries, miners and settlers from all corners of the world made their mark on the island. Marriage with local Maori women created strong family and cultural links to Rakiura. Te Punga o Te Waka a Maui, the original Maori name, positions Stewart Island firmly at the heart of Maori mythology. The more commonly known and used name is Rakiura, translated as "The great and deep blushing of Te Rakitamau" an early Maori Chief, seen today as the glowing sunrises, sunsets and the Aurora Australis or Southern Lights. Enjoy Stewart Island on your own or via Azamara Shore Excursions®. A relaxing day at sea on board Azamara Quest. Morning arrival into Sydney’s beautiful harbour, sailing past the Opera House and under the famous harbour bridge. Sydney is the state capital of New South Wales, the most populous city in the country, and sits on the Tasman Sea along the southeast coast of Australia. Surrounding Sydney Harbour, the city has a rich artistic and cultural life: the iconic Sydney Opera House is not only a prominent feature of the famous skyline, but also a designated UNESCO World Heritage Site. Stroll through the streets of the city to shop, dine, and view spectacular architecture and heritage buildings including Parliament House, Sydney Town Hall, and the Australian Museum. Visit popular sites like Manly Beach, Darling Harbour and Taronga Zoo for the Australian wildlife exhibits plus wonderful views of Sydney Harbour, or tour the city on your own via bike along Sydney’s cycleways. Enjoy Sydney on your own or via Azamara Shore Excursions®. Enjoy three nights in beautiful Sydney at the outstanding Langham Sydney, with golf at two of its finest golf courses – The Lakes and the iconic New South Wales Golf Club. Kauri Cliffs was designed and built by David Harman of Golf Course Consultants, Orlando, Florida. It is a par 72 championship golf course that measures 7,119 yards / 6,510 metres with a selection of five sets of tees to challenge every skill level. Tee selection is an important decision here, with gorges and fairways with some of the healthiest and thickest grass in the world making it easy to mount up a tally of lost balls. Fifteen holes view the Pacific Ocean, six of which are played alongside cliffs which plunge to the sea. The beautiful inland holes wind through marsh, forest and farmland. Kauri Cliffs is currently ranked by Golf Digest as #39 among the top 100 in the world. Cape Kidnappers is consistently rated the #1 course in New Zealand and has received critical acclaim from around the golfing world. This Tom Doak design occupies a huge expanse of property, with the drive from the public road to the clubhouse taking you through a sheep and cattle station. The golf course is set on pristine land, wedged between the station and the huge cliffs of the Cape. The much photographed course has a number of holes separated by deep ravines which run down to the South Pacific Ocean. The course also offers commanding views over the wine region of Hawke's Bay and the nearby small port town of Napier. Royal Wellington Golf Club was the first club to receive “Royal” status in New Zealand. It enjoys a beautiful setting alongside the Hutt River near Silverstream. Founded in 1895 at Miramar, the club moved to Heretaunga in 1908 and built an 18 hole course along with its current historic and elegant club house. The course was expanded from 18 to 27 holes in 1972. The present championship course was redesigned by Greg Turner and Scott Macpherson and opened in 2013. Royal Wellington has been host to seven New Zealand Open Championships and host venue of the 2017 Asia-Pacific Amateur Championship. Christchurch Golf Club whas a proud history that dates back to 1873. The club is the second oldest in New Zealand and the fifth oldest outside the United Kingdom. Its Shirley Links course has held numerous New Zealand Open and Amateur Championships. In 1990 it hosted the World Amateur Team Championship. The course is renowned world-wide as a challenging championship course of the highest quality which offers a fair test of golf for both club and professional golfer. The Club Patron is former Club Champion Sir Bob Charles, New Zealand’s most successful professional golfer, best known for winning the 1963 British Open at Royal Lytham & St Annes, England. Chisholm Links, located just outside Dunedin, is a genuine links course in the truest sense of the word and may well be considered the hidden gem of this golf voyage. Developed on reserve land in the 1930s, several of its holes occupy a magnificent headland wedged between two beaches. It is hole #9 which guests tend to remember most keenly with the tee clinging to the edge of a huge precipice high over picturesque Tomahawk Beach. The playability and character of the holes along with striking views over the Pacific Ocean and neighboring beaches make it a very special experience. The links have previously hosted the New Zealand Amateur Championship in 2003 plus three Australasian PGA Tour Events. Jack's Point Golf Course, is situated between the majestic Lake Wakatipu and 2,300 vertical metres of the Remarkables Mountain Range. Jack's Point was named after a 19th century Māori local named Jack. He was awarded a medal from the Royal Humane Society of Britain after saving the life of a man when they had capsized in Lake Wakatipu in winter 1862, an extraordinary rescue. It traverses through wetland to the lake edge encountering steep bluffs, indigenous vegetation and wildlife. The course is not only one of the most spectacular in the world but with an 18 hole par 72 Championship course offers a challenging and lasting experience to any calibre of golfer. The Kinloch Club is a recent addition to New Zealand’s golf selection, opening in 2007 as Jack Nicklaus’s signature course. Although the course is situated far inland it pays homage to British Links. Situated on volcanic terrain it seamlessly blends the raw links style into age old kiwi sheep farming territory, surrounded by craggy hills and scenic views of the imposing Lake Taupo. It is now considered by many golf experts to be the #1 course in New Zealand and is sure to give even the most experienced golfer a rugged test.